Ford Motor Company, headquartered in Michigan, USA, was founded by Henry Ford on June 16, 1903. Ford Motor Company is one of the world's first automobile manufacturers and automotive industry leaders. It owns equal shares by Koç Holding in Turkey. Intense interest in the automobile brand in our country, Turkey continues its journey in the road. 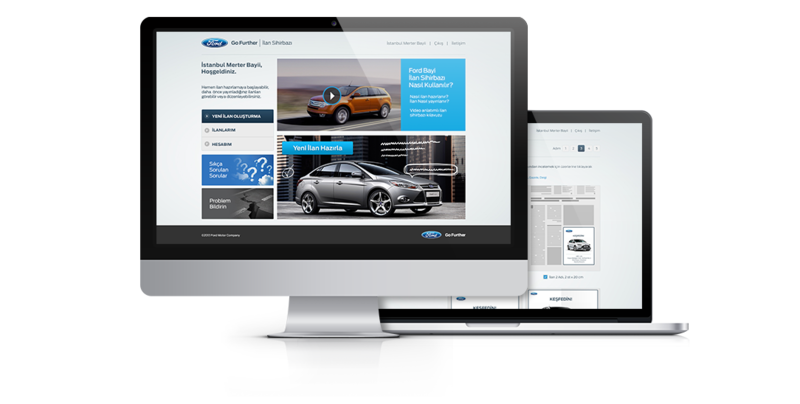 The Ford Ad Wizard application allows brand owners to create customizable marketing materials. Advertisements prepared according to Ford standards can be managed by an easy-to-use digital channel for all masters. All solutions developed for the Ford Advertisement Wizard digital channel management are structured to reflect the brand identity in the best way with 360 degree service understanding. It is integrated with the LuckyEye infrastructure and design. The Ford Advertisement Wizard facilitates the creation of programmed auto-announcements for vendors' advertising activities. After the advertisements are customized by the dealer, they are approved by the advertising agency and then Ford Dealer Communication Department. After approving both sections, the reseller officer downloads the high-printable version of the announcement as pdf on the system. The system is used by approximately 84 dealers. Approximately 750 printed advertisements are prepared annually. As the system became operational, the number of advertisements prepared by the franchisees increased by more than 75%. The use of digital channels in communication with business partners and gentlemen provides many advantages, such as cost advantage, acceleration of processes and protection of brand identity. The advantage of the budget management system is that they instantly see and manage the budgets of Ford and its dealers. Local marketing efforts of the shoppers are supported and motivated in this regard.